Chelsea Green Publishing Company, 9781603587099, 352pp. A diagnosis of Alzheimer's disease in 2016 is startlingly similar to a half-century ago. Despite decades of research and millions of dollars invested in uncovering the causes and developing treatments for this devastating illness, progress has been slow, with each new "blockbuster" drug proving to be as big a disappointment as the ones that went before it. Today, an Alzheimer's diagnosis is a death sentence. However, there may be ways to prevent, delay, and possibly even reverse the course of this crippling neurodegenerative disease. In The Alzheimer's Antidote, Certified Nutrition Specialist Amy Berger presents a multi-pronged nutrition and lifestyle intervention to combat Alzheimer's disease at its roots. Berger's research shows that Alzheimer's results from a fuel shortage in the brain: As neurons become unable to harness energy from glucose, they atrophy and die, leading to classic symptoms like memory loss and behavioral changes. This is a revolutionary approach--one that has been discussed in the scientific literature for years but has only recently been given credence in clinical settings, thanks to extremely promising studies wherein Alzheimer's patients have experienced complete reversals of the condition. Medical and scientific journals are full of research showing alternate ways to fuel the starving brain, but no one has been bringing this essential information to the people who need it most--until now. In a culture obsessed with miracle medications, the pharmaceutical route for tackling Alzheimer's has been a massive failure. Pills and potions don't address underlying causes, and regarding Alzheimer's, they typically fail to improve even the symptoms. As a metabolic problem, the only effective way to treat Alzheimer's may be a multifaceted approach that fundamentally reprograms energy generation in the brain. The good news is, the secret is as simple as switching to a low-carb, high-fat diet. 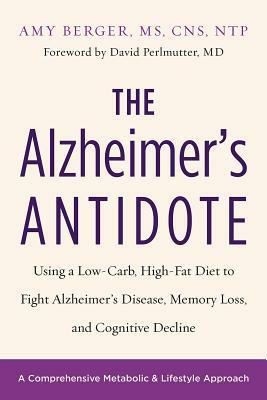 The Alzheimer's Antidote shows us that cognitive decline is not inevitable, but if it does occur, we don't have to sit idly by and wait helplessly while it progresses and worsens. Amy Berger empowers loved ones and caregivers of Alzheimer's sufferers, and offers hope and light against this otherwise unnavigable labyrinth of darkness.